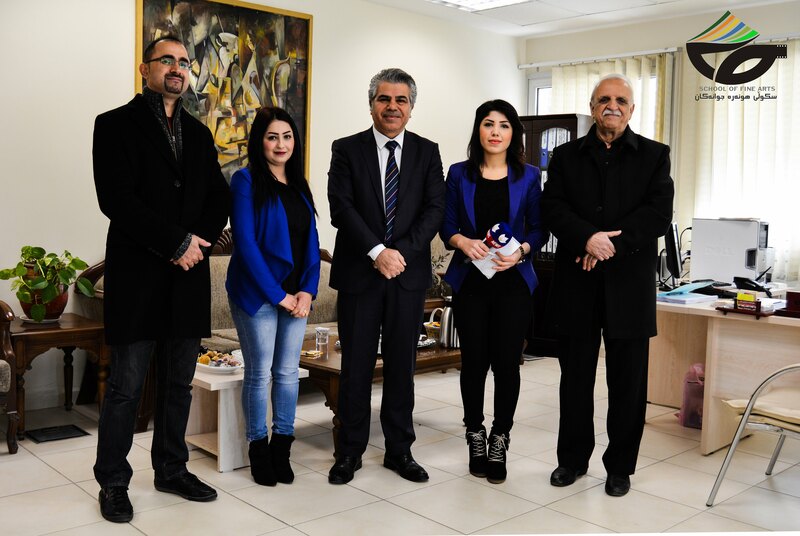 Today, Sunday 3rd of Jan 2016, Dr. Rebwar Saeed the Head of the School of Fine Arts and Mr. Sherko Mohamad , Lecturer in the Music Department have participated in a programme in Kurdsat TV Channel called ( Kurdsat News ) with the Kurdish well known actor ( Mr. Abduli Hama jwan) and Ms. Didar Omer. The purpose of the programme was to discuss the Art conflict in the Sulaimani CIty caused by the political and economical crisis in 2015 and it's influences on Arts in general in 2016, particularly on theater,cinema,music and plastic arts. ئه‌مڕۆ یه‌ك شه‌ممه‌ ڕێكه‌وتی ( 3 / 1 / 2016 ) به‌ڕێزان دكتۆر ڕێبوار سه‌عید سه‌رۆكی سكوڵی هونه‌ره‌جوانه‌كان و مامۆستا شێركۆ محمد مامۆستای به‌شی میوزیك له‌ سكوڵه‌كه‌مان له‌گه‌ڵ هونه‌رمه‌ندی ناسراو ( عبدولی حمه‌ جوان ) و هونه‌رمه‌ند ( دیدار عمر ) به‌شداریان كرد له‌ به‌رنامه‌ی ( Kurdsat News ) كه‌ پرۆگرامێكی كه‌ناڵی ئاسمانی كوردساته‌ وه‌ گفتۆ گۆیان كرد له‌ باره‌ی دۆخی هونه‌ر له‌ شاری سلێمانی و قه‌یرانی ساڵی 2015 و كاریگه‌ریه‌كانی له‌سه‌ر دۆخی هونه‌ر له‌ بواره‌كانی ( شانۆ و سینه‌ما و موزیك و شێوه‌كاری ) له‌ ساڵی 2016 دا .